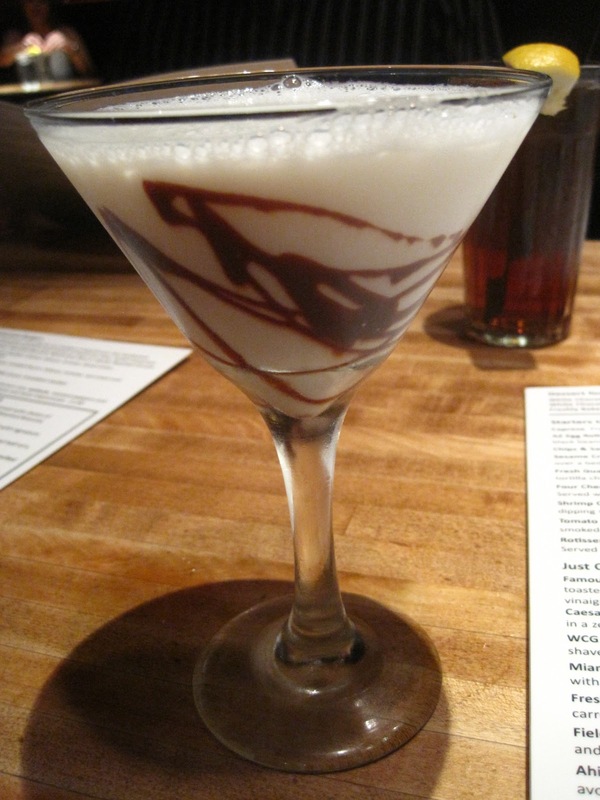 When asked where I wanted to go out after my graduation, I jokingly replied, somewhere that has chocolate martinis. I had heard of such things, but never seen them in person--and certainly wasn't expecting to find them in the greater Phoenix area. But at The White Chocolate Grill, you can indeed order a White Chocolate Martini. I expected the drink list to be available online with the rest of the menu, so I didn't write down exactly what is in this martini. But as I recall, it has chocolate vodka and Godiva white chocolate--possibly something more, but that's all I remember. I am obviously not a big alcohol drinker; my interest was purely from the chocolate side. And this was in fact my first martini, though it's a bit distant from the ordinary. I have, however, had two kinds of chocolate wine (a review of the second is probably coming in the next week or so), and that is the closest comparison I can make of this drink. As you can see, it is mainly white liquid, with a drizzle of chocolate around the glass. The longer you let it sit, the more that drizzle will sink into the drink. The alcohol taste isn't completely hidden by the sweeter flavors, but there also isn't a huge chocolate flavor. It is white chocolate, though, so I wasn't really expecting anything more. It's a sweet drink, but not candy sweet or cloying sweet. I won't die of regret if I never taste it again, but it was nice to try for once. I always say that you can tell everything about a restaurant based on its dessert. Sometimes you can even tell by reading the dessert menu, but there was little to learn from White Chocolate's descriptions of basic items like apple pie and chocolate souffle. These are the two desserts my table got; I snitched a piece of the flaky, cinnamon pie crust before turning to my share of the souffle. It appears simply. It looks okay, but a more careful or sculpted look to the whipped cream would have helped appearances. The thing that I did notice right away was that this souffle cake tasted like it had been made out of melted chocolate. This not only affects the taste but also the texture, making it moist and rich. It's lighter and less dense than most flourless chocolate cakes. If the white chocolate in the Martini was from Godiva, perhaps this cake used Godiva, too? I had to make sure a place called The White Chocolate Grill hadn't been too audacious in its choice of name, and you know, I think they just might be worthy of the title.